A2600 Adventure (USA) in 00:31.56 by Alyosha. 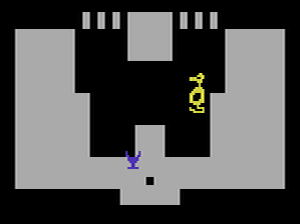 Adventure is a first-party game released in 1979 for the Atari 2600. The goal of the game is to find the enchanted chalice and return it to the gold castle while avoiding the three dragons guarding it. It was the first action-adventure game, and also the first game to have an inventory, a continue system, and a widely-known Easter egg. The author, Alyosha, ignores the fearsome dragons and breezes through the maze, finishing the quest in a little over half a minute. This run is 0.41 seconds faster than the predecessor movie by negative seven.